You know all those little chores around the house just waiting to be taken care of? Not the regular, need-to-do everyday ones like laundry and cooking, but the ones that aren't super pressing, that you keep putting off? The ones that sit there, silently accusing you, making your shoulders sag just a little every time you see them? Well, I decided yesterday that I was just going to deal with them (or at least the loudest and most annoying of them). It's been rainy and humid here, too hot to be outdoors, so it was a good time to be inside with the AC and just git r done. Just so you know, it's not all tea parties and rainbows here. Our down comforter has been heaped up on the floor since the beginning of May. It only needs a trip to the laundromat. 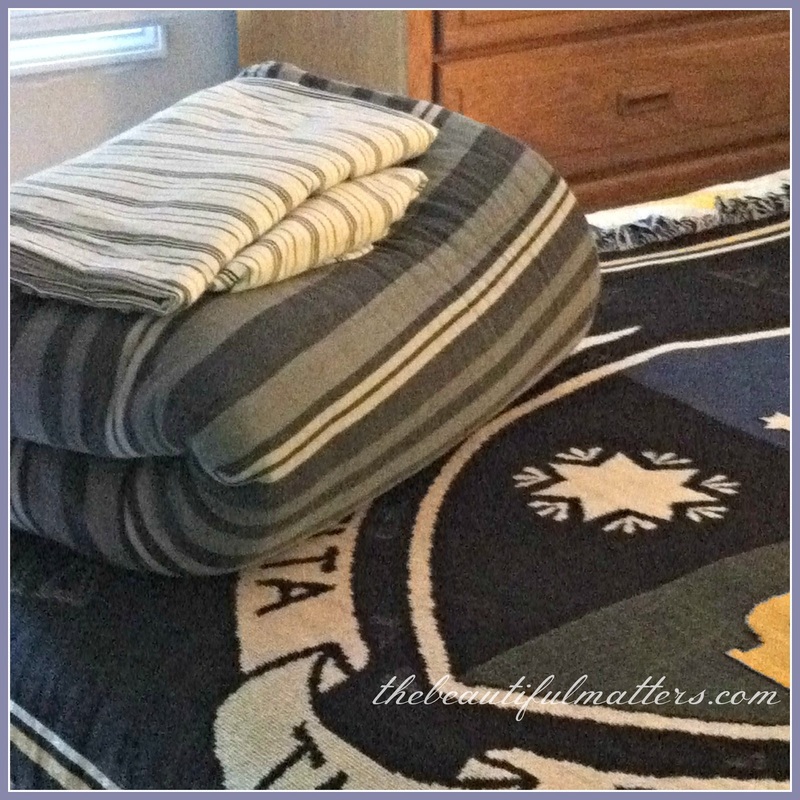 The gray striped comforter came home from college in May and needs a seam repaired. And why is that green blanket just piled on top, and not in the linen cupboard? So for two months, I've been looking at this eyesore. I have to do it eventually, so why didn't I take care of it right away and save myself the aggravation of seeing it every time I came in the room? Twenty minutes to mend the seam on the aging, just-two-more-semesters-to-go comforter. Boom. Back in my son's room (and out of ours! ), ready to go back to college in late August. Get to the laundromat. 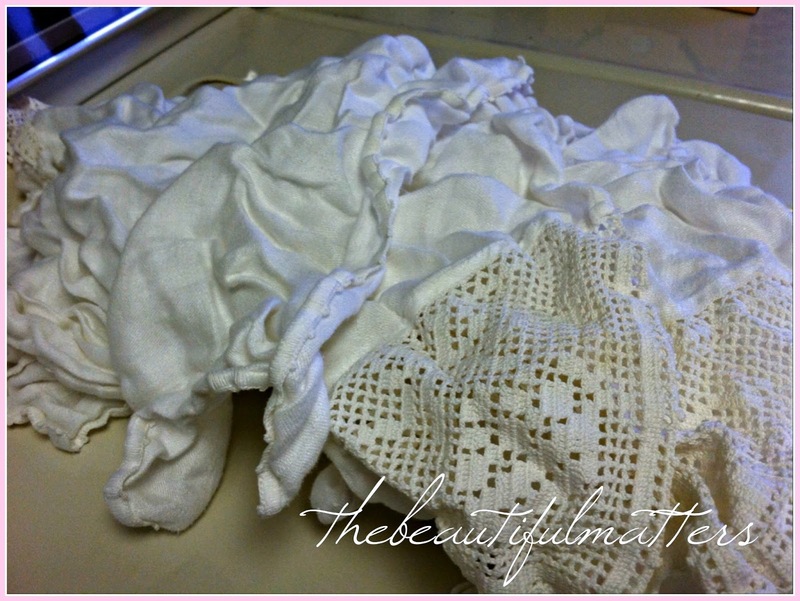 Run to the grocery store after putting the queen-sized down comforter in a 5X heavy-duty washer. Run back, put in dryer, and get home to unload groceries before they melt. Run back, dry another 40 minutes while I peruse a catalog. Boom. Done. A little extra work, but really, how hard was that? Ready to store in the guest bedroom/craft room closet (oh dear, that could use some organizing). Uh oh, looks like that yellow tablecloth needs to be ironed. And speaking of ironing . . . I won't even tell you how long these have sat at the bottom of my clean laundry basket, underneath the always-present lone socks waiting for their mates to show up. And, really, so easy to iron. So satisfying to accomplish a few things . . . In the bigger picture, things are a bit chaotic. What with all the campaign interns in the dining/living room (my son is running the campaign for our local senator) and our kitchen floor being re-done and my husband painting . . . I almost didn't post this. Super embarrassing, especially with the table gone. But, just keeping it real. This is a job we've been meaning to do ever since we moved in, and that was years ago. Like I said, taking care of business. This is what the corner of my family room looks like now. 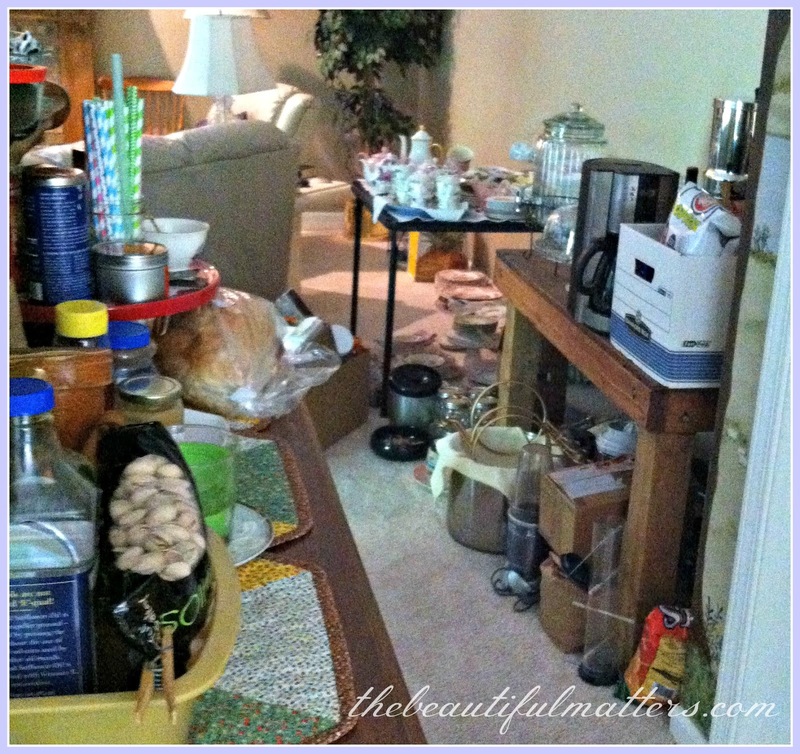 Everything had to be pulled out of the pantry, and the china cupboard needed to be moved out as well. um, did I really need to watermark this photo? We will need to stay out of the kitchen for five days. The coffee pot is already in the powder room, and I have a supply of paper plates on hand. Sandwiches, take-out, fruit . . .
Can't wait to see the result. Now I'm off to do a little more ironing and mending while I'm still inspired. Linking with Share Your Cup Thursday. It's so hard to take the time to do those odd jobs and projects and as soon as they are done....there are more! lol I am trying to sew some every day even though I am NOT caught up with blogging or housework! Enjoy your day! Time for tea, isn't it? Hugs! 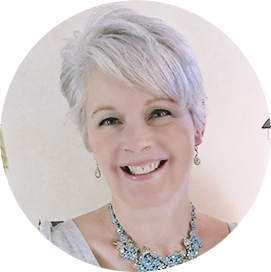 I think your story is so true for so many of us. It made me smile to read. Best of luck with your kitchen! When I finally do tackle those jobs, I always ask myself what took me so long. It will be so nice when your floors are finished. We loved your post. Yes indeed, it's not all tea parties and rainbows around here either. Glad you were inspired to get those little things done. I know how good that feels. I've been working away on a few of my own. Loved catching a glimpse of your ironed piles... those lacy triangles remind me of book shelf lacy pieces I have in the store cupboard that haven't been used or ironed in years. Don't feel bad Deborah, I think we all procrastinate and I seem to do more now that I'm retired. At least you've put your foot down and started moving on these tasks, so good for you! I am so with you!!!! Why is it we put off the "little" things....? One of my "dreads" is ironing my husbands dress shirts for work...blah.. I will wash them.. hang them but ironing...NO.. I will wait until he is looking for shirts to wear..."Hey, do I have any clean shirts?" Of course, they are all over there in that pile...waiting to be ironed...lol.. Good for you girl..get er done! As for me, the pile of shirts are still there...lol Have a great day! Blessings! Ugh! Moving twice and going nowhere is how I captured my blog post documenting my similar situation of having our floors redone. I feel for ya, Deborah! Ironing is a great task when you want yo just chill out - the smells of the fresh, clean linens are like an infusion at a spa. You're gonna love your new floors when they're done; the work to get there, unfortunately, not so much. I am just like you and hate to do certain unwanted projects too like ironing 3 of my husbands dress shirts! I may do that tonight! Lol! I do wish you luck with getting the floor done and everything else. It is hard getting to all the tedious jobs...but as you say it feels so great when you get them done. Having shown us the floor before I hope you'll show us when it has been redone. I used to put off ironing but have come to love it. 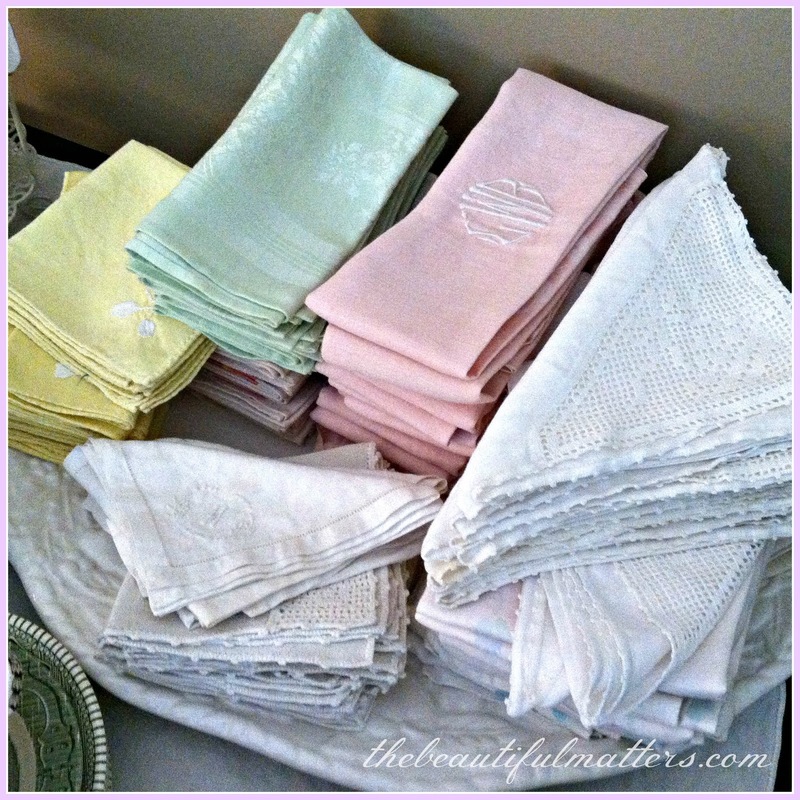 Especially like the linen tea towels and napkins all piled up looking respectable. Wonderful! Now that's the way to get a project accomplished. It is just like they say...the hardest part is getting going. My project involves vacuuming upstairs with the big vacuum cleaner and I just don't want to haul it up there. I'm telling you...I have avoided it for months now. Sigh. Oh sweetie, you've been busy!!! 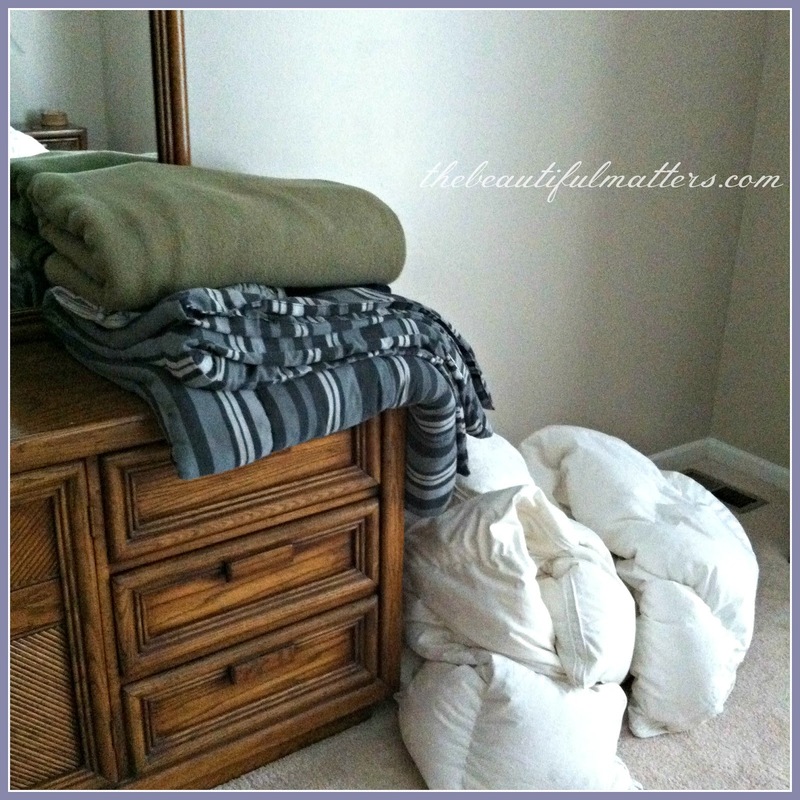 I have some UGLY projects coming up, like revamping our master bathroom and bedroom... I'd like it after, but not looking forward to! You will see some ugly photos, don't worry! Congrats honey! 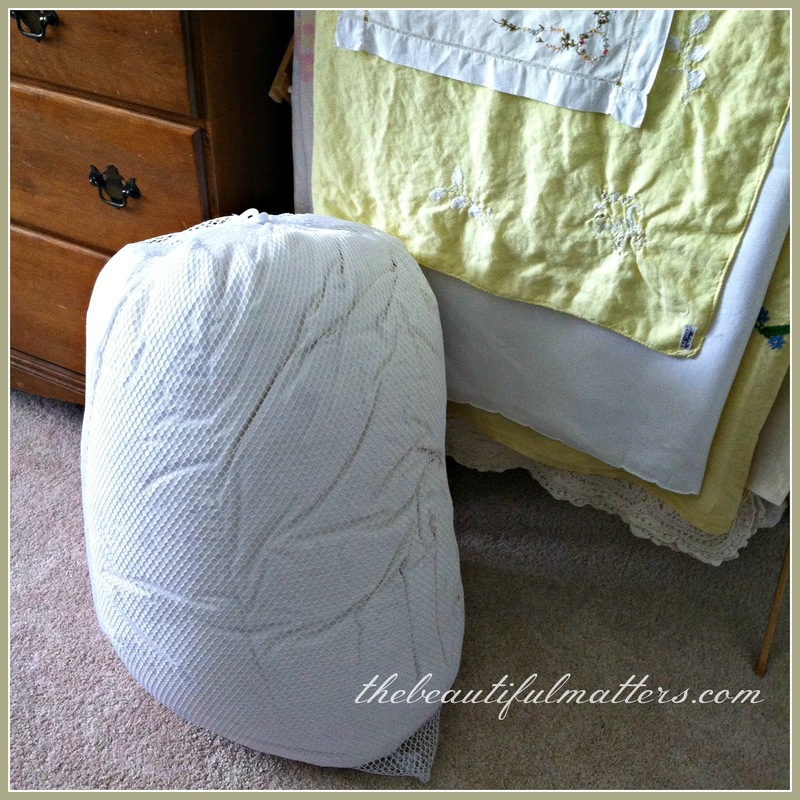 Yeah, we all have such a list of having to do things... Talking about down comforters, I tackled my problems by enlarging the former Dutch (smaller!) twin down comforters by adding a strip of squares from a Company Store on-sale down duvet. Next I added about 16" of width to the Dutch cotton duvet covers... Quite a job but now I love them with the super light summer down duvets from Yeves Delorme that I got on Bastille Day a couple of years back with a discount. Makes one feel very proud for having tackled. Did three sets of duvet covers like that. WHY are companies constantly making those down duvets longer, wider...? To make us buy new covers all the time? We too take them to the laundromat; if needed. Ironing I just managed last week; got way behind with a dinner for 11 the night before our departure to Florida. What I do than is folding laundry hand dry out of the Miele dryer, into a laundry basket and place them in the freezer. 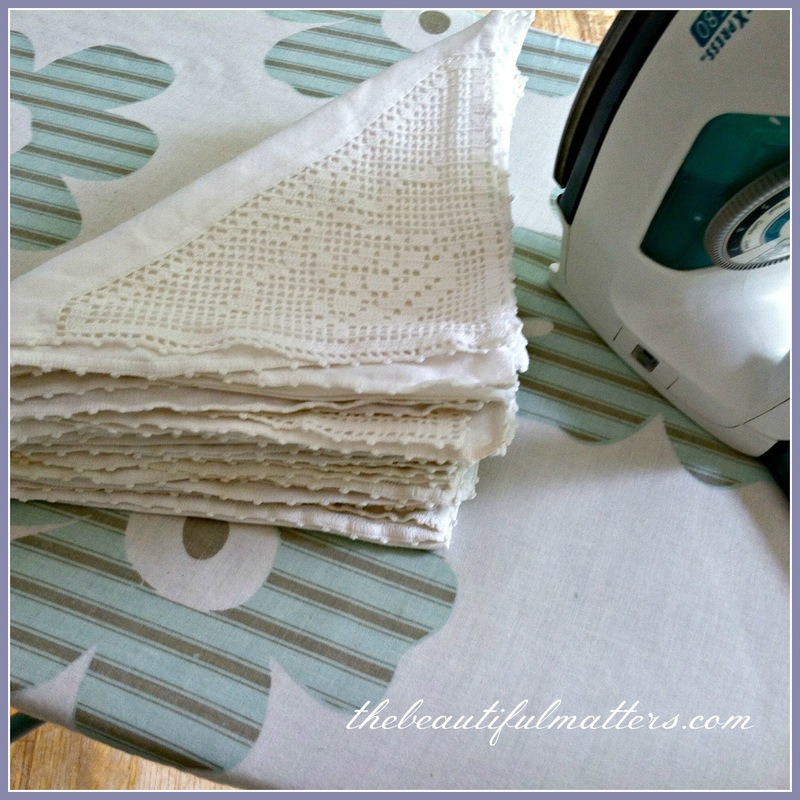 Safe, out of sight, out of dust and so easy to iron when you get to them! 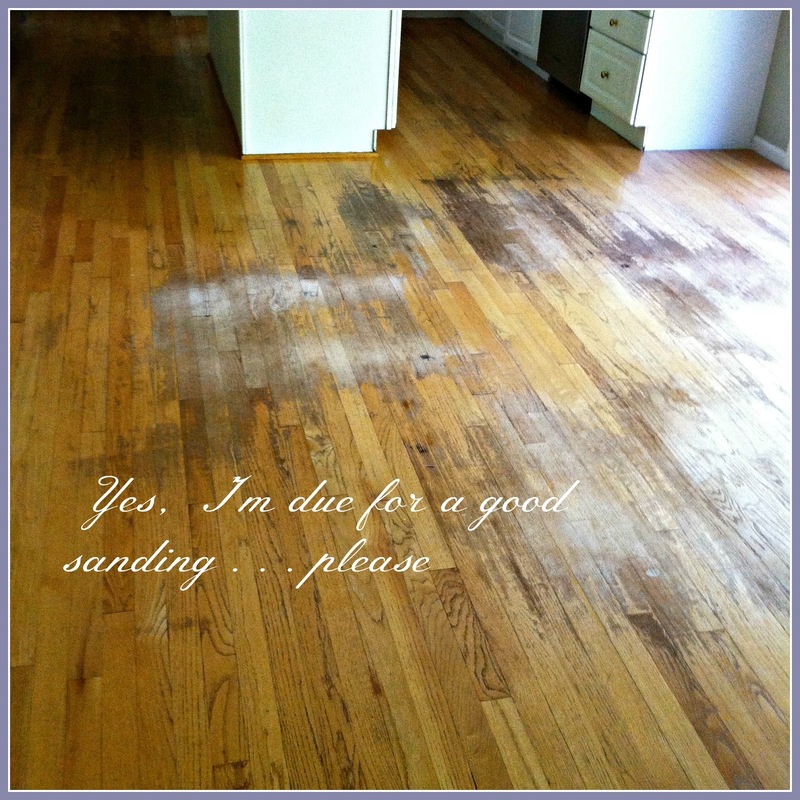 Your wooden floor around the kitchen table looks like having been scratched by not adding those soft-wooden-floor-friendly gliders under the legs... Sure, over time it will show! But you will have a lovely new kitchen shortly! Hope you show your floor when it is done, I love wood floors, which I have in my house, they were made from trees on my farm. 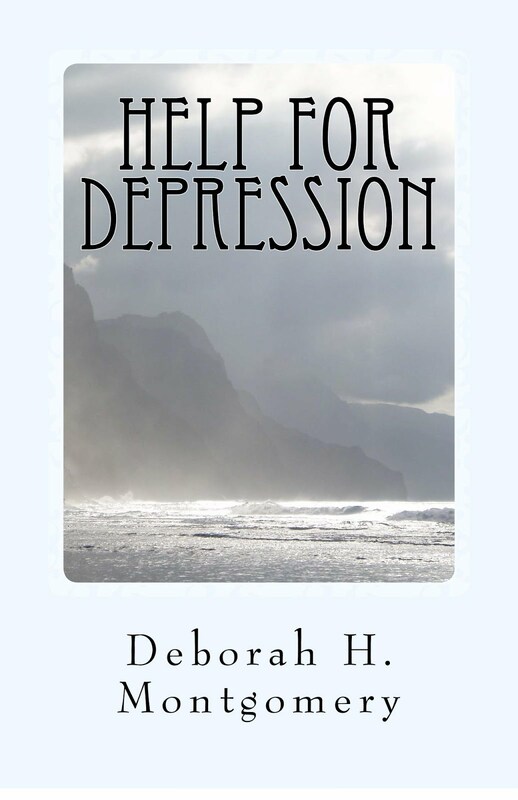 Hi Deborah, well you are a friend after my own heart. I have been there, are there now and seem to visit often. LOL It;s those little BIG jobs that seem to just add up. I always have ironing but when I get to it, I find it calming and peaceful. Crazy, I know, but I like to iron and especially linens. Your floor will be gorgeous when complete. Looks like it is beautiful wood. When we did our remodels are house looked just like your pic. It felt like we were camping out during the work. Oh well, gotta do what you gotta do. It all comes together eventually~~ Thanks for sharing and now I'm inspired to get busy!! I am the world's worst about taking care of paperwork on my desk and also, cleaning out my car. Thanks for keeping it real; I think we all are the same! Best wishes with the work! I love that you keep it real. Thanks for the inspiration. I have a lot of chores around this house just like yours. Have a great weekend! Your post seems to resonate with a lot of us! I know I can sure relate to those random chores that hang around and begin to add up, just waiting to be taken care of. Always a great feeling when they can be crossed off the to do list. Notice how you refer to it as 'business', which instantly brought to mind its opposite, 'pleasure'! I can totally relate as I literally JUST washed the last of the comforters, (of which there were 4), and it's not that I washed them by hand, (a very traumatic thought! ), so why did I wait sooooooooooooooo long?! It's like you say, 'The ones that sit there, silently accusing you, making your shoulders sag just a little every time you see them...'. Anyway, since I was o a roll, I clipped my neglected houseplants, (the garden gals are getting all the attention right now! ), tidied up the storage room, and even managed to begin a long-awaiting paint project, (to be posted soon, as promised!)! Congrats on tackling those chores! The linens look lovely. Keeping it real is right my friend! And you are not alone. I have a stack of clothes in my walk in closet that just need simple things like a button sewed on, etc. But always too busy for those simple things. My bedroom has looked very similar the past week. We pulled everything out of my sewing room and put it in there. When my youngest daughter saw it she said, "Mom, if I didn't know any better I would think you were a hoarder. " But when you put it all away it looks good. Made me laugh. I'm almost there! Thanks for sharing with SYC. Love those pretty napkins. Can I just say THANK YOU from the bottom of my heart? I have a healthy collection of those kinds of chores. SIGH. I've been saying the past few weeks, "After Peter leaves to go back to college ...." then I'll do such-and-such. So Many Boxes and stuff to go through. Unfortunately much of it is in the garage, and we all know how easy the garage is to ignore! Your watermark on that photo was HYSTERICAL. \I am so impressed with what you achieved today. I could do with a day like that to sort some cupboards out.